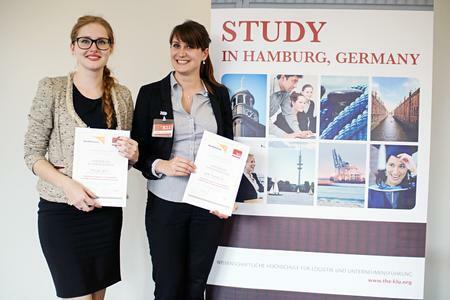 The Kühne Logistics University held its second case competition for Bachelor's students last weekend. Eighteen competitors from Germany and Europe spent all Saturday poring over a humanitarian logistics case study with a view to presenting a good result to the jury. The task was a realistic disaster relief assignment for which participants in two-person teams had to draw up a meaningful strategic solution. "Solving the case with a team partner you had only just gotten to know was a challenge in itself, but our different academic backgrounds complemented each other and helped us to solve the task professionally," said the winner Sybille Lips. "Drawing up an emergency logistics plan for an earthquake in Colombia under pressure of time is highly significant in terms of content. Presenting it - and in English - to three professors and a specialist with practical experience was very exciting," Florentine Genss added. Entrants came from Poland, Turkey and even Qatar to take part in the case competition, and all of them were ambitious students who love challenges of this kind: first to learn something and compete with others and then to win a scholarship to study at the KLU. "The commitment to the case study that the participants showed and the results they achieved were most impressive," said Professor Maria Besiou, Assistant Professor of Logistics at the KLU. World Vision Germany's Daniel Ginsberg accounts for the keen interest shown in the competition as follows: "Humanitarian logistics is an exciting sector that triggers emotions even among people who are not logistics specialists because it appeals to the emotions. People can visualize tasks that need solving to cope with a humanitarian catastrophe, and the case study enabled participants to gain a deeper insight into the key role that logistics plays at aid organizations." Demand was so strong and interest so great that another case competition will be held at the KLU next year. The Kühne Logistics University - Wissenschaftliche Hochschule für Logistik und Unternehmensführung (Academic University for Logistics and Business Management) is an independent, state-accredited private university located in the HafenCity docklands area of Hamburg and sponsored by the nonprofit Kühne Foundation. 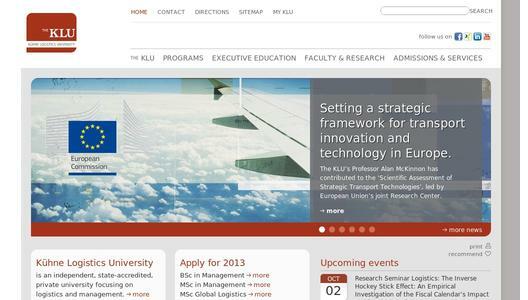 The KLU currently offers master's programs in global logistics and business management. What distinguishes them is the international character of the student body, an optimal staff-student ratio, and a first-class corporate network. With what will be over 20 professors, the KLU covers all of the relevant areas of teaching and research in the fields of logistics, supply chain and business management. It plans to provide bachelor's, MBA, and Ph.D. programs. The KLU's International Summer Schools offer excellent further education opportunities for professionals. In bundling international teaching and research competence in logistics and business management, the KLU is one of a kind in the world.